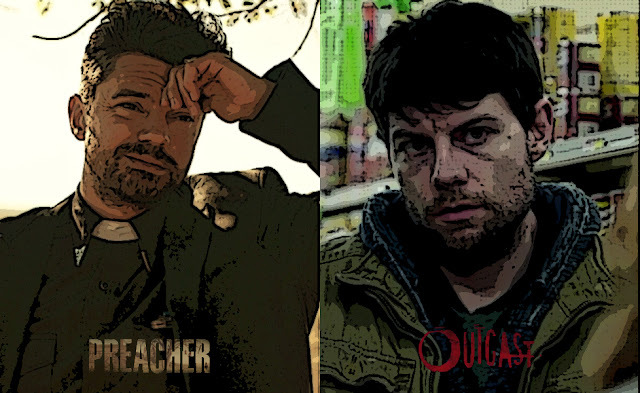 A few weeks ago, two new cable shows started airing: Preacher (AMC) and Outcast (Cinemax). Both are based on comic books, both have big names attached to the productions, and - since the basic descriptions for both involved religious leaders and demonic possession - neither appeared to be ‘my thing’. However, given that they both also hinted at supernatural forces (which very much is my thing), and both have actors I like, I gave them a chance. I’ve watched three episodes of each. Outcast is about Kyle Barnes (Patrick Fugit), a young man trying to right past wrongs by returning to the small town where he grew up. He’s got an extraordinary ‘power’, but isn’t sure what it is, how to use it - or if he should. Preacher is about Jesse Custer (Dominic Cooper), a young man trying to right past wrongs by returning to the small town where he grew up. He’s got an extraordinary ‘power’, but isn’t sure what it is, how to use it - or if he should. And that’s pretty much where the similarity ends. Outcast is the more ‘normal’ of the two shows - if you consider The Exorcist normal. When Kyle was a boy, his mother (possessed by the devil) abused him regularly...until he somehow banished the demon from her. The struggle left her comatose, and Kyle lived the rest of his formative years with a foster family. He married, had a daughter - and then Something Bad Happened. We don’t yet know exactly what, but he has a restraining order against any contact with his daughter, and after several years away he’s living as a recluse in the old family homestead and enduring whispers and stares from the townsfolk whenever he does venture out. Enter Reverend Anderson, the hard-drinking, card-playing local pastor (played by Philip Glenister, whom I adore). The reverend - who also has a Mysterious Past with regard to his wife and child - has noticed that his parish seems to have more incidents of demonic possession than usual (No, I’m not sure what constitutes ‘usual’). The Reverend believes that Kyle - having banished the devil before - can help him in his mission to set everything on the right path. Kyle isn’t sure if he wants to put himself out there, plus there’s an underlying question whether Kyle is really on this path of good, or actually possessed himself. There’s also animal mutilations and the ubiquitous “man in black” - who may or may not be the Devil/Death/a shapeshifter/responsible for the mutilations/responsible for other deaths in town/you get the idea [/the smoke monster from Lost - TVEmpress]. The first two episodes were quite creepy and interesting, mostly character development with a secondary exorcising-a-local-demon plot, and technically they looked very good - but I was still waiting for the show to hook me. Unfortunately, the third episode didn’t help; I got a definite “demon of the week” procedural vibe…not my favourite, but I can stay interested if I care a lot about the characters and/or the weekly plot is very compelling. Instead, the episode randomly introduced an extensive and extremely confusing side-story about Kyle’s foster sister while the main possession story made little sense (I had no idea why the cop wanted to help the man who killed his wife); and the actual exorcism seemed repetitive - not a positive when we’re only three eps in! Worse, I found Kyle quite unlikeable. I think Outcast needs to decide if it's a “demon of the week” procedural, or a serialization focusing more on the characters. There was so much going on in episode three, but none of it ended up working for me. However, I’ll keep watching for now, if for no other reason than Philip Glenister. Next, Preacher...how on earth do I describe this one? It’s confusing. Weird. Politically incorrect. Hilarious. Horrifying. It has gory, over-the-top fight scenes (think Quentin Tarantino brutality combined with 70’s B-movie silliness). This is a series that people will either ‘get’ or not get, love or hate…and although I don't really have a clue what's going on half the time, I get it and I love it! As the son of the town preacher, Jesse had promised his father that one day he’d carry on for him and “save the town”. When his father died, Jessie gave up the criminal life he'd been leading (but not his drinking and drug habits), returned home and became the preacher. He’s absolutely useless at it. Until one day, he’s hit - literally - by a force from outer space (at least that’s what I thought, because it was zipping by planets…but I guess it was actually from heaven). Anyway this force hit other religious leaders and zealots from every belief on the way (including Tom Cruise) and they all exploded. Messily. But Jesse didn’t explode, instead he developed a special power where people would literally do exactly what he told them to. It didn’t work out too well for a few people before Jesse realised what he was capable of. Jesse’s sidekick is Cassidy (wonderfully played by Joseph Gilgun - who was Rudy in Misfits). He’s an Irish ne’er do well who met Jesse at a bar, and is now living at the church, drinking all the sacrificial wine and basically being thoroughly disgusting. He helps Jesse practise his new ability (wondering if he’s a Jedi), and protects Jesse from wonderfully stereotypical bad guys who keep reappearing and are apparently trying to kill him. Oh, and Cassidy’s a vampire. The real, blood-sucking type. There’s a wealth of other characters including Tulip (Jesse’s bad-girl ex who keeps trying to pull him back to a life of crime), Arseface (you’ll understand, trust me), Emily (nice, no-nonsense girl who helps at the church) and various others involved in just about any depravity or “to-each-their-own” activity you can think of. There’s even a mysterious cowboy (Graham McTavish) riding around in the 1800’s. I know, it all sounds utterly ridiculous - and yet it works. I think Outcast is trying too hard to make sense - and it’s glaringly obvious when it doesn’t. But Preacher just throws it all in there and lets the audience take what they want. And I want more.